The Professional Coin Grading Service (PCGS) will display Sunnywood’s "Somewhere Over the Rainbow" set of exquisitely toned Morgan silver dollars and PCGS Co-Founder David Hall will participate in an important educational forum at the Florida United Numismatists (FUN) annual convention in Orlando, January 8 – 11, 2009. Hall will be a featured expert in the FUN seminar, "2009 or 1929? You Can Survive and Thrive During the Economic Crisis," at 1:15 p.m., Saturday, January 10. "The Sunnywood’s collection is a 100 percent complete, basic set of circulation strike Morgan dollars (1878 – 1921) with spectacular natural toning. The set is ranked number six in the PCGS Set Registry with a weighted grade point average and set rating of 64.611," said BJ Searls, Set Registry Manager. 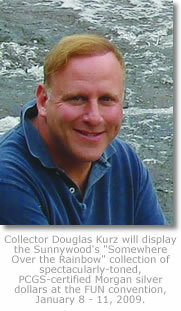 "The collection was assembled by attorney Douglas Kurz who will be on hand at FUN to discuss the composition of the set. 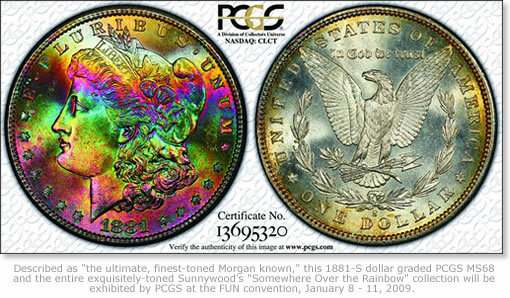 One of the main attractions is an 1881-S graded PCGS MS68 with vivid rainbow toning that’s considered by many Morgan dollar enthusiasts to be the ultimate, finest-toned Morgan known." The Eliasberg specimen 1893-S graded PCGS MS65, a coin that is pictured in the popular book, "100 Greatest U.S. Coins." The 1882-S dollar, graded PCGS MS67, is pedigreed to the collection of former National Football League linebacker, Gregg "Ironman" Bingham. It is described as "spectacular" and "an exceptionally beautiful and technically superb example of what would otherwise be a common date San Francisco Morgan dollar." 1880-S, PCGS MS68, described as having an intensely toned blue, pink and gold obverse and a rainbow toned reverse. 1885-CC, PCGS MS66, 100 percent rainbow toned obverse with the weave pattern of the burlap mint bag in which it was stored for decades. 1885-O, PCGS MS67, superb gem classic with banded rainbow toning. 1886, PCGS MS66, an extraordinary dollar from the famed "Battle Creek" group of original bag-toned silver dollars. "Sunnywood’s collection generated a great deal of interest as it was reviewed by our graders," said PCGS President Don Willis. "It was a pleasure for us to examine many of these beautiful coins. Doug Kurz’s accomplishment is the result of a long term and patient effort, and should generate a great deal of interest at the show." Kurz describes the goal of the Sunnywood’s "Somewhere Over the Rainbow" collection as "an alternative to the usual sets of white coins. We wanted to show the collector community that Morgans can be completed with originality and color, and need not be dipped ‘blast white….’ The result is a fascinating and eye-popping collection that was highly challenging to assemble." He explained that while assembling the collection he tried to strike a balance between color and technical grade. "The most attractive pieces in terms of color and eye appeal are not necessarily the highest graded pieces. Registry ranking has sometimes been sacrificed for the sake of overall eye appeal." A Harvard Law School graduate, Kurz began collecting stamps at the age of six, but quickly switched to coins with the encouragement of an uncle. In his youth, Kurz encountered other kinds of "toned" coins. He was intrigued with chemistry and conducted an unfortunate experiment on his father’s Lincoln cent collection. With every good intention, he decided to surprise his father by cleaning the old, brown cents by taking them out of their album and soaking them in vinegar. The copper coins turned an unnatural orange color and then developed a green crust. "He didn’t speak to me for a week," Kurz recalled. "And, 37 years later, they’re still hidden away in shame at the back of a cabinet in my parent’s house." Sunnywood’s "Somewhere Over the Rainbow" set will also be exhibited by Kurz and PCGS at the Long Beach, California Coin, Stamp & Collectibles Expo, February 5 – 7, 2009. The free, interactive PCGS Set Registry program was established in 2001 and now includes more than 37,300 sets. In addition to every major U.S. coin series, the registry also has categories for Australian, British, Canadian, Chinese, Costa Rican, Cuban, Euro, German, Indian, Japanese, Mexican, Panamanian, Philippine, Puerto Rican, Russian, South African and Swiss coins. For additional information, visit online at www.PCGS.com. PCGS is a division of Collectors Universe, Inc. (NASDAQ: CLCT).